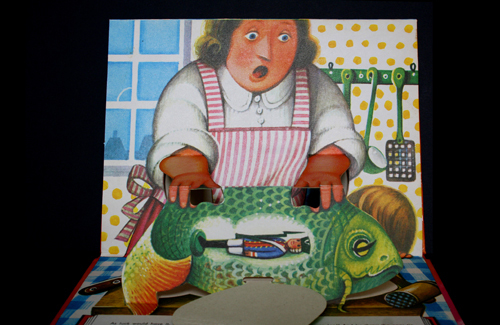 This is one of four late 60s / early 70s Eastern European children's pop-up books that I found for 10p each at my local charity shop a few years ago. This gives the impression that my local charity shops excel in literary treasures, but no, this was a blip in quality and most are full of unread copies of dirge like Bridget Jones & Tony Parsons. There's probably a very interesting story as to why these ended up in a village as insignificant as where I live, but it's not a story that I'm privilege to. The books are all in near perfect condition, which given the culture clash of delicate pop-up books and small children's desire to wear them out, seems quite odd. 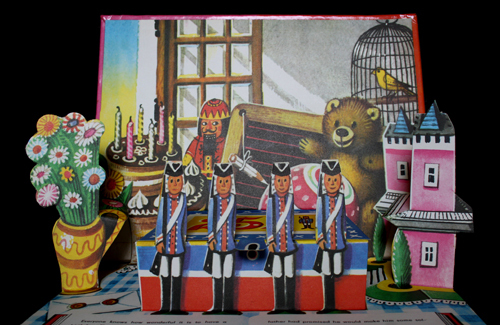 This one is a five page pop-up English print (Murrays 1977) version of ARTIA's Czech 1972 version of Hans Christian Andersen's The Steadfast Tin Soldier. 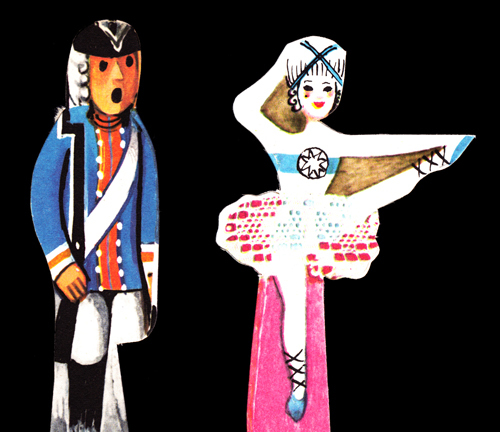 The pop-up design & drawings are by popular Czech artist Vojtěch Kubašta (1914 - 1992). 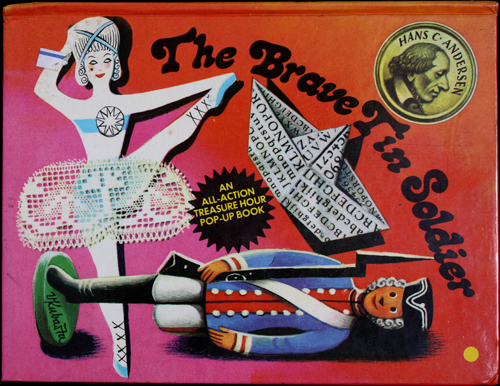 Despite being a rather sad & bitter-sweet story of a tin soldier's unrequited love and ultimate demise, the whole book is quite upbeat and told in vivid colours. Every page opens to give way to a complex set piece of scenes with characters that come to life with tabs. I was not surprised to learn that Vojtěch's work is popular and collectable. 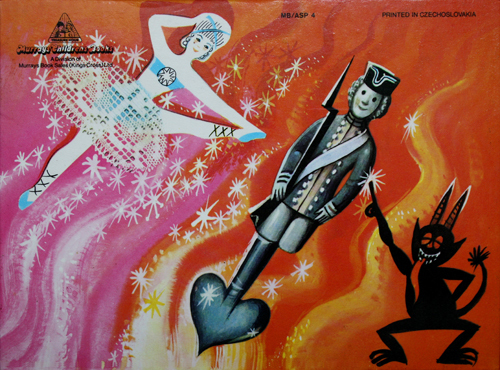 I'm particularly taken by the ballerina (with her 'real paper doily' dress) and the devilish jack-in-the-box that gives me the fear. 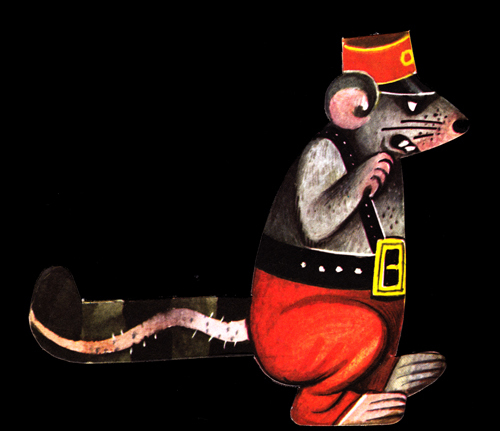 The rat ranks pretty high on the sinister scale too. Kubašta studied at the Polytech University in Prague & graduated with a degree in architect in 1938. This career path only lasted two years, and by 1940s he was working as a commercial artist / book designer. 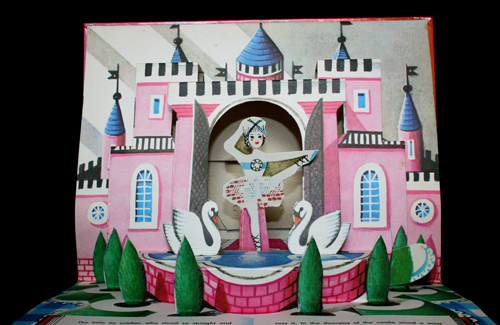 Following the switch to Communism, and the nationalisation of the entire Czech publishing industry, Kubašta became involved in advertising a wide range of Czechoslovak products for the western market, it was here that he found an interest and love of creating three-dimensional pop-up work. 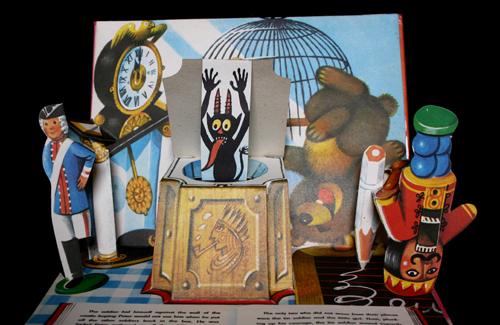 By 1965 he had designed his first pop-up book, based on the folk tale Little Red Riding Hood. This was published by Czech government owned Prague based publishing house ARTIA. 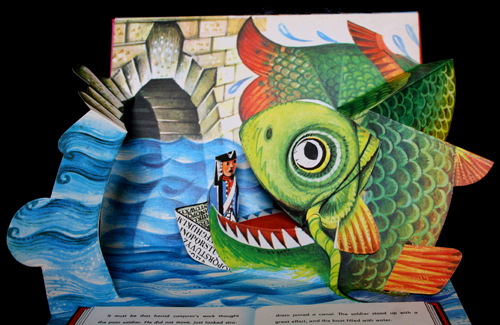 The success of the book led to him being responsible for many of ARTIA's pop-up children's books (mostly based on folk tales). He was one of their leading illustrators and book designers, selling 35 million copies with translations in 24 different languages. His talent and skill were widely acknowledged at the time, including by Walt Disney, for whom he designed many pop-up movie tie-ins during the 60s & 70s, although he's not directly credited on these for the work. One of the other four books I found with this, is also by Kubašta, a version of Puss In Boots, which I might take photos of and add here at some point in the future. For larger versions of these images click here. The first of the links below, a catalogue from an exhibition in Florida, has a wealth of information and many images of his other work, if you would like to see more. 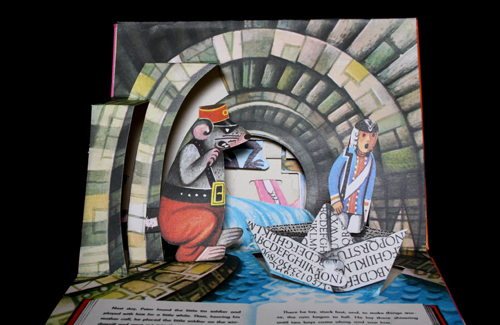 A superb illustrator whose work I'm also a big fan of I have about ten copies of his books the paper engineering is nothing short of incredible!